In the show on Saturday 23 May, Lisa Holloway shared some recipes making the most of fresh seasonal produce, with asparagus the main ingredient in two of the dishes she talked about. Then lo and behold, the Girls Around Town‘s second guest Katharine Maxey arrived bearing gifts – bunches of asparagus, freshly picked on the farm that morning, for June and Sue. Guess who will be making either the soup or the risotto here this weekend?! The Velouté (a posh name for soup!) is from a recipe by Wesley Smalley of Charlotte’s Bistro in Chiswick, while the Risotto is by food writer, recipe developer and author Yvonne Ruperti. 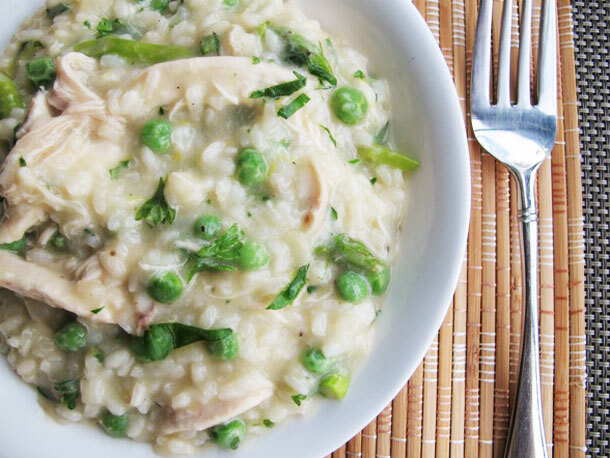 Lisa puts her own twist on the recipes, replacing the wild garlic in the soup with spring onion sometimes and, for the risotto, leaving out the peas and using a whole bottle of white wine instead of most of the broth! Place the onion, leek, celery, thyme and bay leaf in a heavy-bottomed pan and cook over a medium heat for 10 minutes. Add the potatoes, vegetable stock, milk and cream and cook until the potatoes are tender. And the wild garlic and spinach and allow to wilt. Season with salt and pepper, then blitz in a food processor until smooth. Peel and quarter one onion. Place the chicken, celery, onion and 2 teaspoons of salt in a stock pot and just cover with water (8-10 cups). Bring to simmer over a medium heat, then reduce heat to low and simmer gently until the chicken is tender and falling off the bone (about 1 hour). Transfer the chicken to a plate, strain the broth and return it to the pot. When the chicken is cool enough to handle, remove the meat from the bones and shred into bite-sized pieces. Bring the broth to a simmer over a medium heat. Add the asparagus and cook until just tender (about 2 minutes). Remove the asparagus with a slotted spoon and set aside. Add the peas to the broth and cook for 30 seconds, then remove with a slotted spoon and set aside. Remove the broth from the heat but keep warm (you should have 6 to 8 cups of broth). Finely chop the remaining onion. In a large saucepan, heat the oil over a medium heat until shimmering. Add the onion and 1 teaspoon of salt. Cook, stirring, until the onion is soft (about 6 minutes) then stir in the butter. Add the rice and stir to coat. Cook, stirring, for about 3 minutes. Reduce the heat to low and stir in 1 cup of the broth – continue to cook, stirring, until the broth is almost completely absorbed. Continue to add the broth, 1 cup at a time, and stirring, until the rice is tender but retains a slight bite – it should have the consistency of a creamy, thick soup (about 30 minutes). Add extra water if there isn’t enough broth to cook the risotto sufficiently. Stir in the peas, asparagus, chicken, lemon zest and half a teaspoon of pepper. Stir in the Parmesan, season to taste, then stir in the parsley and serve immediately. Put all in clean bucket and stir twice a day for 5 days. You can add more lemons, maybe less sugar, to make to your own taste. < Party with the Pod!